Rain expected this weekend forced organizers of the 1st Santa Barbara International PuppetPalooza Festival, which runs from Thursday to Sunday, to make some last-minute venue changes. Friday’s “Celebration of Families” event and Saturday’s “Puppetzilla Puppet Slam at the Naked Puppet Theatre” will both be held at the Alhecama Theatre, 914 Santa Barbara St. Downtown Santa Barbara’s former Macy’s building at 701 State St. will serve as the space for the festival’s Puppetopia featuring Brian Hull's "Kaytek the Wizard" and Yulya Dukhovny's "A Real Elephant” on Saturday, and Sunday’s PuppetPalooza final event. Click here to purchase tickets for the festival. The puppetry festival in Santa Barbara is the first of its kind on the West Coast, according to Kriegman. The festival displays the art of puppetry from toy puppets and giant puppets to hand puppets, shadow puppets and micro puppets, and more. “It’s a combination of television, art, kids and adult puppets,” Kriegman said. “It’s a range of puppetry that people haven’t seen." On Wednesday, “Snook” the Eco Sloth met Santa Barbara Mayor Cathy Murillo outside City Hall. 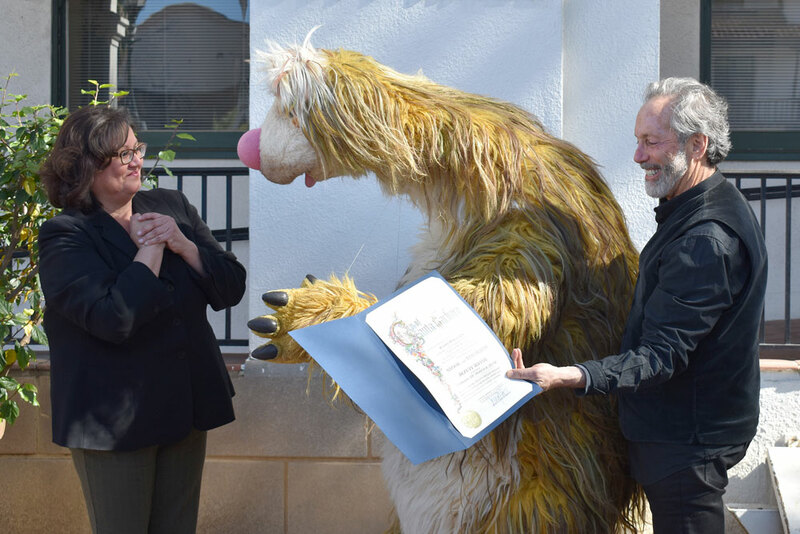 Murillo issued a proclamation naming the puppet as the city’s deputy mayor through Sunday. As deputy mayor, the puppet will be involved in various activities throughout the four-day festival, including visiting area schools and senior communities, and appearances throughout downtown Santa Barbara to help build excitement around the first-ever puppet festival. A full list of events and locations is at http://puppetpaloozasb.com/events.